Its name is not as famous as Stockholm, but Linköping (read: Linshooping) keeps the peace of a city away from the metropolitan bustle. In fact, the city is located in northern Sweden is one of the five major cities in the country that had earned the nickname 'the most peaceful country in the world', because of the low level of criminality there. This is what makes me, Regina Sari, want to visit Linköping, a big city with a countryside atmosphere dominated by lakes and canals. As soon as the train arrived at Copenhagen Station, Denmark, I rushed into the train and immediately searched for the seat according to the number listed on the ticket. The train only stops no more than 3 minutes. Each passenger must be quick to get into the car. A typical train in developed countries in Europe, the train that will take me to Linköping is very good. I immediately sat on the bench near the window. Although it was late afternoon and the sky slowly began to darken, it seemed, really, dear to just pass the view of the open sea, before the train began to enter the tunnel under the sea, to finally appear on land in the Swedish region. There is not much I can do along the trip for 3.5 hours. After the train officer, accompanied by the police, patrolled to check the ticket and the identity of the passengers, I chose to take a break. Several times the next station stops announcement was made in Swedish. I also tried to listen, in order to get ready before arriving at Linköping Station. Finally, I arrived at the city located in Östgöta Plains, precisely in Östergötland Province. Linköping train central Station, located adjacent to the bus terminal. We are also enough to walk to the city center. Got off the train, a friend was waiting for me. He then took me on foot to his residence not far from the city center. Along the way I saw many bikes parked neatly. Yes, just like any other European country, bicycles become one of the main means of transportation for its inhabitants. In 2002, Linköping was nicknamed the Swedish Biking City of the Year. Apart from the quietness of a small town, Linköping has complete and modern urban facilities and infrastructure. In fact, for day care alone the cost is subsidized by the government. All infrastructure development costs are derived from high taxes, about 20% -25% of revenues, to be paid by each of its citizens. Linköping is a city that stood since the Middle Ages. As evidence, some of the roads built at that time are still visible in some parts around the town square or Stora torget, such as tanneforsgatan, St Korsgatan, and Ågatan Streets. Like most cities in Europe, the town square is an interesting place to go. Similarly, the city center, which is surrounded by shops, restaurants, and churches typical classical European style. St. Lars' church and Linköping cathedral are the two churches that became the city landmarks. 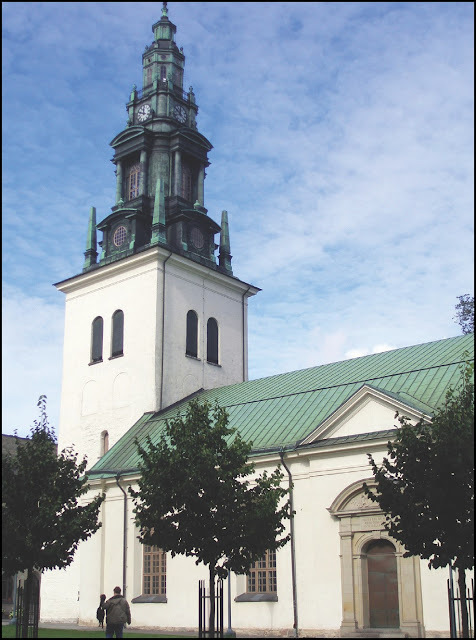 St. Lars' church is located at the corner of Storgatan and St.Larsgatan. church that has been established since the 19th century is dominated by white color. impressed very classic with dark green bell tower that always sounds three times each day. With a 107-meter tower, the architecture of the Linköping Cathedral made by Helgo Zettervall is a neo-classical style from the 12th century. a church much larger than Saint Lars' church and has become one of the pride of this city is an enlargement from the previous church that is considered too small to accommodate the congregation. It is quite astonishing to know that the church is 800 years old, of course with various renovations and expansions. The north door is the oldest part of the church, along with the arch romance on the choir spot, where a large cross is hung. the church is also home to many art treasures, one of which is the controversial Henrik Sorensen's work, an altar painted in 1935, portraying Jesus rising from the tomb on Easter morning. Walking past the cathedral, I saw a large yellow building looking like a mansion. this is a city hall or town hall where city government employees work. Founded in 1864, the building was originally a high school. Its function has changed to city hall since 1921. Outside of the building, I saw a signage on the road, believed to be the site of the bloodbath of Linköping which took place in 1600. However, a study revealed that the incident actually happened at Stora Torget Square, in a corner that has now become a Burger King restaurant. Incidentally my friend wanted to return the book to the public library, so we went back on foot because the location is not far away. there was a modern building with lots of windows, almost like a greenhouse, surrounded by grass gardens adorned with beautifully colored flowers all around. Incidentally autumn has just come, so the flowers are blooming. 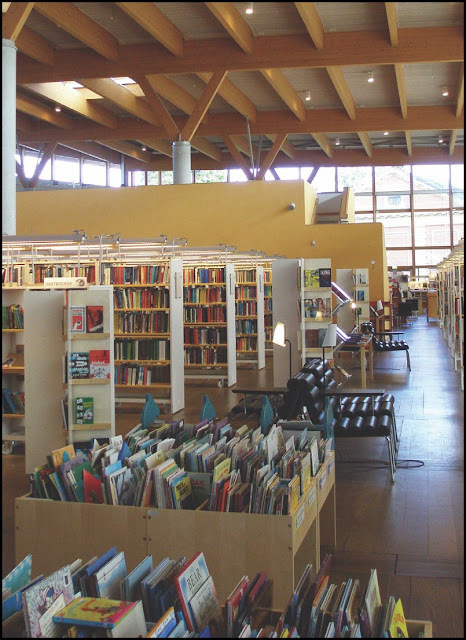 This library is not only the architecture is amazing, the interior is interesting. the room is cozy and decorated with several seats by famous designers, one of which is an egg chair by Arne Jacobson. Really do not stop to amaze, especially when considering the free education system for citizens from elementary school to high school. Sitting reading a book while facing the window with a view of the beautiful garden outside, it feels like I am at home in this library. 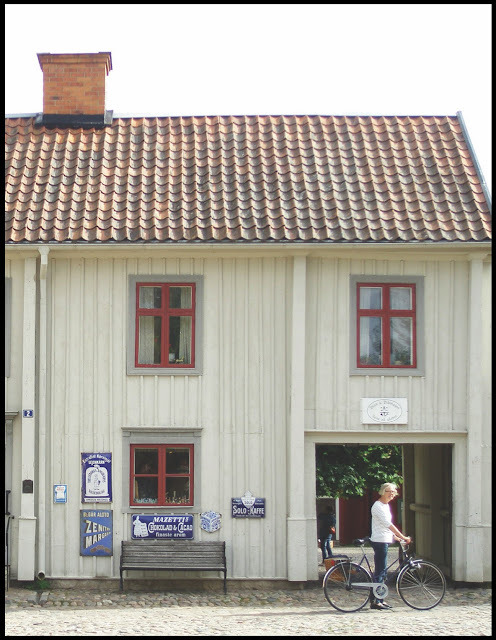 From the library, I headed to one of the iconic destinations, the Linköping gamla, an outdoor museum depicting past lives. To reach this place, we have to use local bus, because it is located about 2 km to the west from the middle of town. Even more fun, the entrance fee is free. Once there, I saw a form resembling a pay phone box that caught my attention, and it turned out to be a public phone box in the past. Here I can see the life of Swedish society in the past, ranging from architectural buildings in the form of wooden houses, large stone alleys, and gardens. Here also show the activities of the community at that time, such as post office, banks, and shops that sell handicrafts and souvenirs that we can buy. Very interesting to me as a person who enjoys visiting museums. After walking around, we stopped at a cafe serving typical Swedish desserts and enjoyed a Fika (coffee break), as is commonly done in Swedish society. Fika can be done anytime and anywhere, usually with coffee and sweet cake. A short stroll through Vallaskogen took us to Valla Farm, a nature reserve with museums featuring rustic history, farm animals, a large play area and a miniature golf course. In the afternoon, another friend asked me to go to an interesting place. We arranged to meet at the train station at 5 pm and go with him from there. oh yes, the Swede is very appreciative and disciplined of time in all respects, both appointments meetings, interviews must be kept, and never abandon the promise, unless it is permitted first. When my friend mentioned the name of the place we were going to visit, göta canal, I do not understand. Probably because of the Swedish pronunciation factor that is unfamiliar in the ear. it is located quite far from the city, which is at Lake roxen, about 16 kilometers to the north of Linköping and again have to use public bus for about an hour. far enough, considering there was no traffic jam. 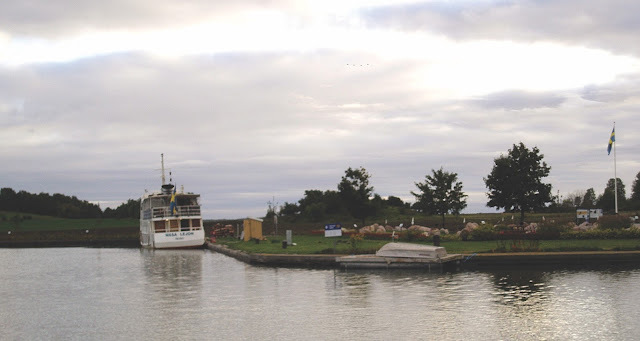 Historically, the göta canal is one of the largest civil projects ever undertaken in Sweden. The canal built in the 18th century extends from Sjotorp in Lake Vänern to Mem on the east coast, 190 kilometers long and a total of 58 locks. From this distance, 87 kilometers is man-made, the rest is made in nature. Its construction took 22 years, and in the 19th century, it became a major transportation route. I also walked to see the beauty of the water gate that used to be active, but now only used as a tourist attraction. From a distance I saw a shadow of a man standing in the middle of the lake. 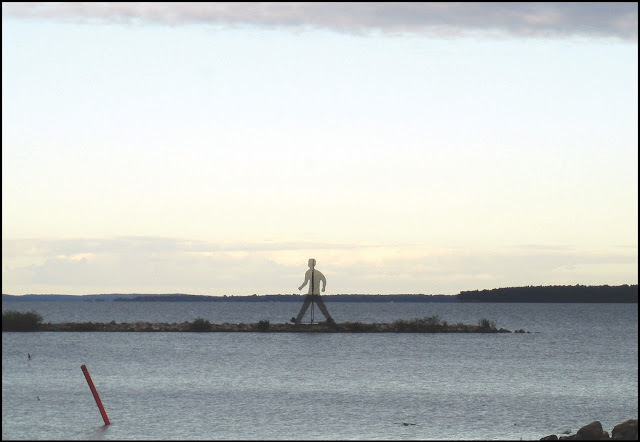 When I approach it, it turns out to be a 9 meter high art installation named Doppelganger or double man. Another thing to do there, is enjoying the scenery while eating in the cafe, playing mini golf, biking or swimming in the lake. Since there is only one bus number to and from the city, bus number 520, then we have to adjust to the bus schedule. Otherwise we could miss the bus and have to wait a long time for the next bus! Arriving in the city center at eight in the evening, Linköping was asleep. But it must be understood. Everything here stopped after 6 pm, all the shops were closed on Sunday. The only ones open at night are some restaurants and nightclubs. Swedish society hours are limited, only 40 hours a week, because they value the balance of life. Godnatt (good evening) ...! Emirates Airlines, KLM and Lufthansa serve flights to the capital city of Stockholm. To go to Linköping , need to use SJ train or bus about 2 hours drive. Although members of the European Union, Sweden still uses Swedish krona (SEK). One of the attractive options of stay is at Elite Stora Hotellet, a four star hotel located in the center of the city and is one of the oldest hotels there. So far the lingonberry name is so familiar in the ears of those who like to go to IKEA, the Swedish home furnishings store. 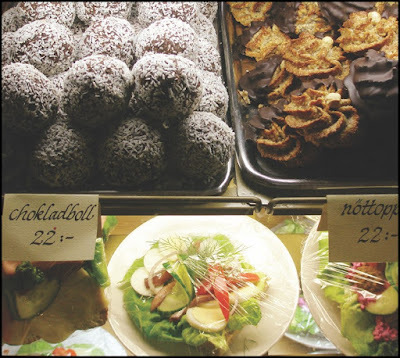 In fact, this fruit is so popular in Sweden, not least in Linköping. Lingonberry is one of the most important ingredients in Scandinavian cuisine.. Typically, lingonberry jam is dip sauce to eat Swedish swedish meatball, accompanied by mashed potato and gravy sauce. Lingonberry is a kind of berry that is not as popular as strawberries and blueberries. The color is bright red like cherry, it tastes sour sweet. The shape is smaller than blueberries. In Sweden, lingonberry plants can be found on the sides of the road or in the yard of the house.